Sometimes you may have the need to put a Pullout shelf behind a drawer front above the working drawer. Here is a simple method to accomplish that. 1) Select a drawer box file that will give you a drawer box that leaves room for the pullout above it. In this case I chose a file that would build me a 6 inch high box when using a moderate height drawer front. 2) Build a two drawer base with no stretcher between the drawers. 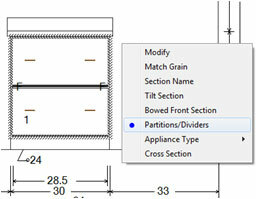 3) Highlight the section and choose Partitions/Dividers from the menu. 4) On the Partition/Divers screen, choose Pullout from the top tool bar. Click on the cabinet section twice. 5) Click the Mouse and choose Restore Cursor. Click on the lower part of the section and move the highlighted Pullout up. Click on the upper part of the section and move the other Pullout up. 7) A variation on this technique can be used if you want a different style of Pullout behind each drawer front. Divide the section into two sections stacked vertically. 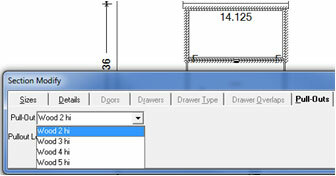 Before you put a drawer in the section, change the section Pullout type to the style you desire. Now make the section a drawer in Details. Next, in the partition/Divider mode, add your Pullout in each section and move them up. 8) View the result. I removed the horizontal partition between drawer sections here too. This will go to the cutting list as well as machine properly in CNC. This can be done in all Manufacturing versions of Cabnetware. The cross section views were done with Cabnetware Ultimate.